Message queue is a great feature introduced in Magento 2. The goal of this article is to show practical example on how to publish (send) message to the queue and consume (receive and process) it. Magento supports MySql and RabbitMQ based message queues. We are going to use RabbitMQ. We are done with server setup. Let’s start coding part. Create a module. In this sample, we use Atwix_Queue namespace. Our goal will be to send a message to the queue on product delete and then listen to this queue, receive (consume) message and log it to the file. communication.xml – Defines aspects of the message queue system that all communication types have in common. queue_consumer.xml – Defines the relationship between an existing queue and its consumer. queue_topology.xml – Defines the message routing rules and declares queues and exchanges. queue_publisher.xml – Defines the exchange where a topic is published. Also, we specify data type of the topic in request attribute:Magento\Catalog\Api\Data\ProductInterface. Note connection type amqp in the file above. Let’s continue with creating publisher class. It is \Atwix\Queue\Model\Product\DeletePublisher. Here we need to specify topic name as a constant and declare method that will publish a message to the queue. Product object will be automatically encoded to JSON. On the screenshot above you can see that there is one message in the queue. Let’s try consume it. From the code above you can see that processMessage method expects instance of \Magento\Catalog\Api\Data\ProductInterface as parameter. 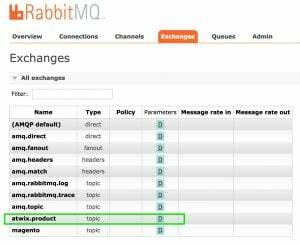 As a result in RabbitMQ management web interface you should see that message has been consumed and as proof of that product-delete-consumer.log should contain a record with product id and sku. Complete module code you can find at Github.